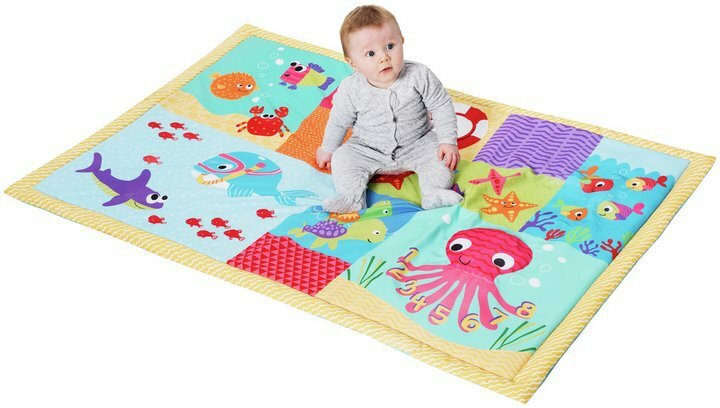 This vibrantly coloured, patterned soft fabric Chad Valley Baby Bright Ocean Large Playmat (150 x 100cm) shields your most cherished from hard floor surfaces, protecting against heavy bumps and knocks. This educational baby mat helps stimulate the senses of your little one in particular hearing, visual and touch. Suitable from birth, place the mat down in an appropriate space and allow your child to sleep or play. Get money off with April 2019 free Argos voucher codes, see if there's a discount code for the Chad Valley Baby Bright Ocean Large Playmat product.